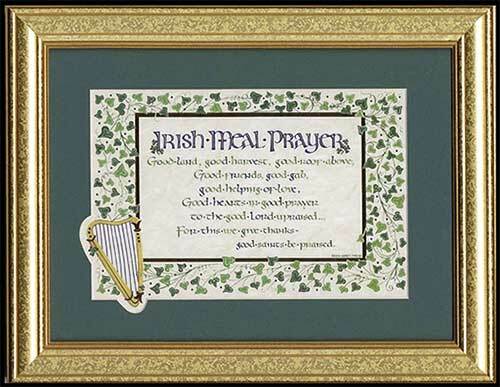 This kitchen blessing is a framed plaque with an Irish meal prayer. For this we give thanks-good saints be praised. This kitchen blessing is a framed plaque with an Irish meal prayer. The Irish meal prayer plaque features shamrocks along with a harp. This Irish kitchen blessing is a print with gold foil accenting that is matted under glass and held in a gold crackle finish frame. This Irish blessing plaque measures 14" wide x 11" tall and it is gift boxed with a shamrock history card that is complements of The Irish Gift House.